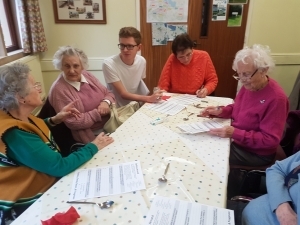 ‘Home Alone‘ – a drop-in club which meets in the Oasis room at St. Peter’s Church on the the 2nd Monday of each month was the destination for the ‘Getting Around’ subject group this month. 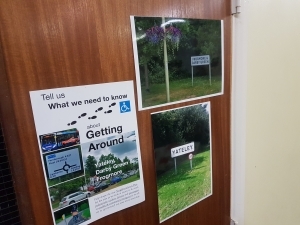 We wanted to find out members’ everyday experiences of getting around Yateley, Darby Green and Frogmore so they can help feed into, and shape this area of our work on the Neighbourhood Plan. A big ‘thank you‘ to everyone for welcoming us so warmly, and allowing us to gatecrash the fish and chip lunch, and sing-a-long. Contributions were energetic, and certainly insightful. We’ll be spending some time analysing the responses, but already, many of the themes emerging chime with much of what we have been picking up in our consulting so far. 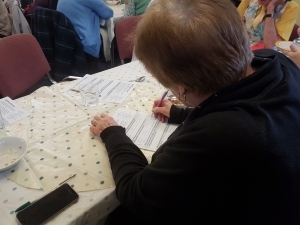 One of the ‘Home Aloners’ busily filling in their consultation form on getting around. On public transport, overwhelming numbers raised the point about a lack of a bus route to Fleet. A number justified their reasons for making this point, particularly on the range of banking services still available in the town. Many raised an issue about bus routes in Yateley not serving the Tudor Drive of Yateley. Another consistent theme being raised was that of the need for clear, and direct pavement routes for pedestrians and wheelchairs. Some mentioned the need for such a path between Yateley and Eversley. As in the original consultation which kicked off the neighbourhood plan process, parking was raised as an issue, particularly in the village area. However, many more raised the scourge of pavement parking – but an issue which, for the most part, requires national legislation. Some specific ideas on lighting were shared too. 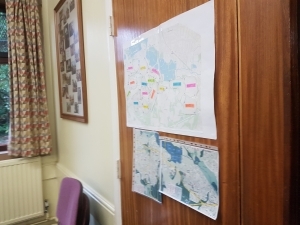 Maps are used to highlight some of the issues, with the larger one one broken down into specific ‘neighbourhoods’ to help highlight local journeys. We’ve also been asking respondents to share their most popular destinations within Yateley, Darby Green and Frogmore, and outside. Amongst this group, two new destinations within Yateley emerged as popular – the Red Cross Hall, and the Baptist Church, alongside the usual ones we had been hearing. Fleet, Farnborough, The Meadows, Reading and Basingstoke were among the most popular outside destinations. 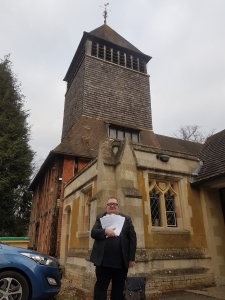 Paul leaving St. Peter’s after the Home Alone session, with the completed consultation forms. Our group’s deliberations continue, but this was a valuable start to the year. Particular thanks to Di and Luke for helping to make today’s session, and the ‘Home Alone’ organisers.